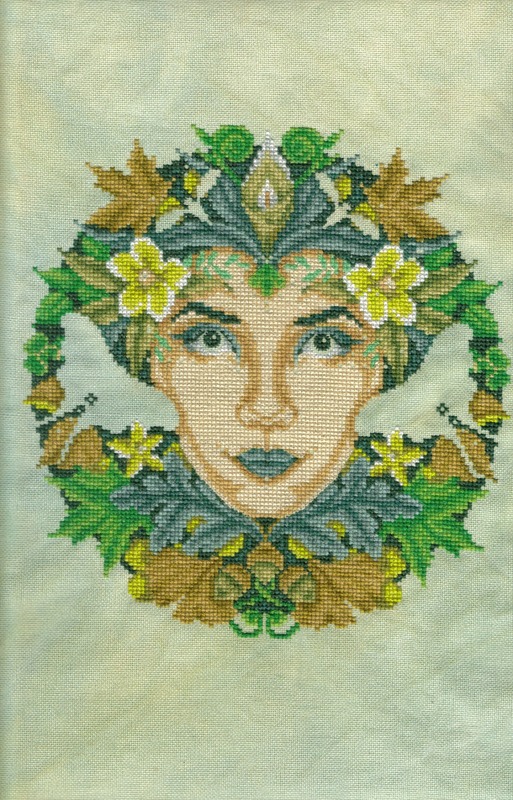 My first monochrome project was Green Goddess which I worked on for the first half of the month. I've posted this picture a couple of times already but one more won't hurt! The rest of the month was spent on my Round Robin mermaid which is not monochrome so no pic today. 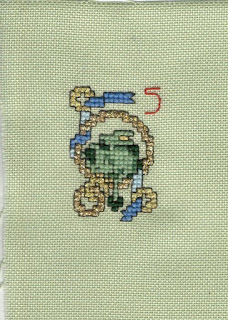 During the daytime I stitched on two more monochromes, the first was my JBW alphabet kitty for May. Thanks to everyone who gave their opinion on which backing fabric I should use. I'm pleased that each of my choices had their fans, just proves I'm not totally colour blind! You were clearly all channelling your inner Pioneer Woman and the gingham was an easy leader. Always reminds me of the late great Bill Hicks "gonna get me some gingham, what's gingham? Ah dunno but chicks dig it!" The other monochrome is a card for a friend so watch your postboxes, friends! I actually forgot to photograph it before mailing so I'm hoping my friend will do the honours for me. I'm using a De Havilland artificial silk in rainbow on 32 count white evenweave, the picture is a scanned one so not the best of the fabric but I'll take some nice ones once the SAL is over. This should be ok, a mermaid is a sort of fish... And she's on a round robin so that's a bird. 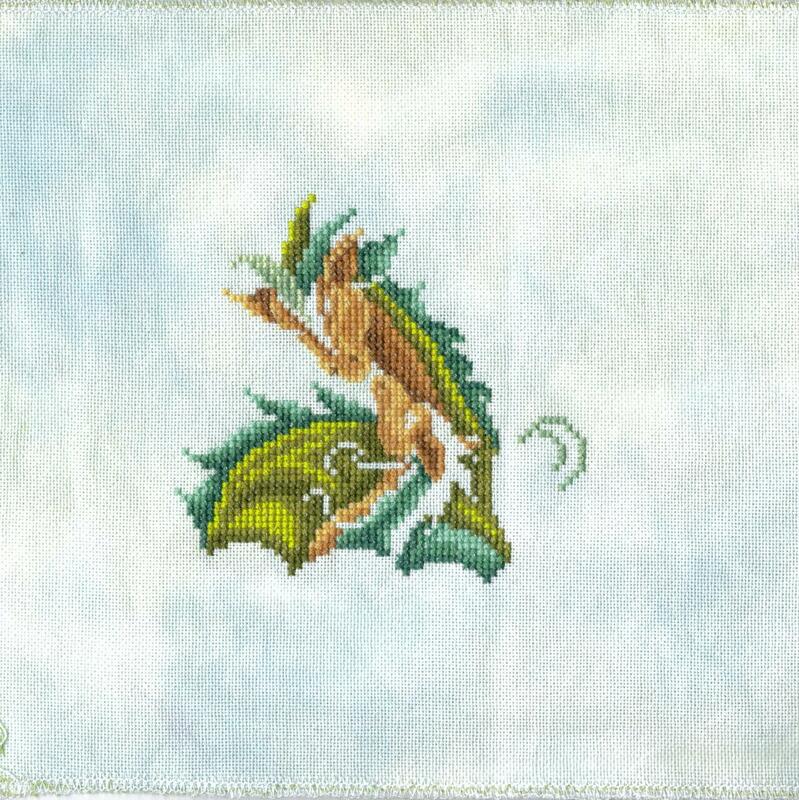 The next things on Green Goddess are the moths and dragonflies. Alphabet Kitty is a cat, as is my choice for the Hallowe'en SAL. So plenty to stitch there in theme. Finally, I haven't forgotten the draw for 400 followers, I've been putting together the blog post along with links to all the wonderful people you chose so it'll be up some time next week. Patience! I wanted a spring blossom feel for the Alphabet Cat and chose green thread on pink fabric. I'm not 100% certain about this colour scheme and am still wondering whether to stitch it again in pink on green. I also can't decide which backing fabric to choose either! So which do you prefer? Option 1, 2 or 3? Boo is stitched on 32count twilight blue linen, it is very stiff! The stars are little smyrna crosses. Finally, I've told a couple of people that the theme for the Summer Blog Hop is "No Place Like Home" as suggested by the Needlecraft Haven choice for last month. I'll do a proper official announcement at the beginning of June. I'm saving it for a day when there's not much stitching to show. ps don't forget to chose your favourite backing fabric, leave a comment. Thank you. It's a Bank Holiday Weekend here in England and hubby has been working 20 hour days so it's just me and the boys and some stitching! 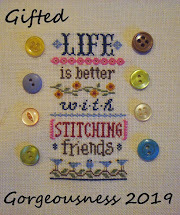 The first piece to be finished is Joan Elliott's April design for the 2013 diary. 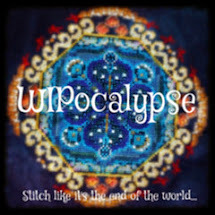 This was the cover gift with World of Cross Stitching magazine last year and there are a group of us stitching-a-long on Facebook. So far I have completed January and April and most of February. I'm starting June's Wizard next and would like to complete him actually in June! The fabric is a piece from a Crafty Kitten grab bag, a sort of blue sky effect. 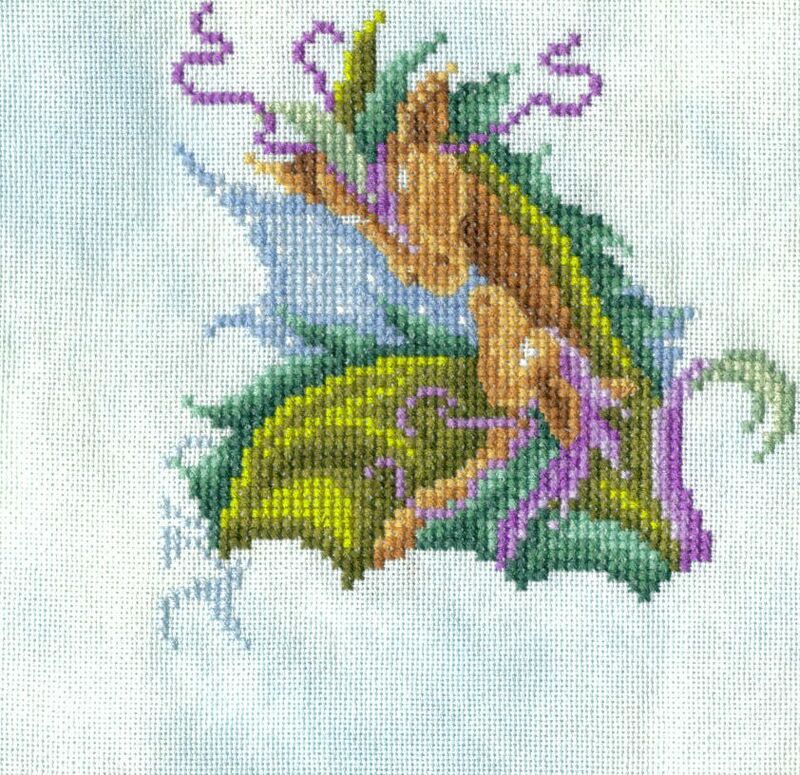 I used all the recommended colours but added backstitch in metallic purple to the purple fronds and also metallic silver bs to the wings. The Large Boy is dropping heavy hints about needing this one in his room! The bling arrived from SewandSo this week so it's all ready when I reach those parts. I stitched this on a piece of Emerald Green aida using DMC threads and a thick Madeira metallic red for the shoes. I got the Maderia threads free from a magazine and I'm not a fan but it was good for this design. I found a great scrapbooking website that had alot of Wizard of Oz themed papers so I'll be ordering some soon and mounting this for my book. Also on the schedule was the next part of the Thread Pickerz Heartz SAL and the Hallowe'en ornie, pictures to follow. I was hoping to start item 7 on my list, April's Word Play by With My Needle but that didn't happen. So the next piece I'm looking at is Hear the Sea Call by Stitchers Hideaway. I have the fabric, the threads and the little shells and stones to attach so it's looking good! 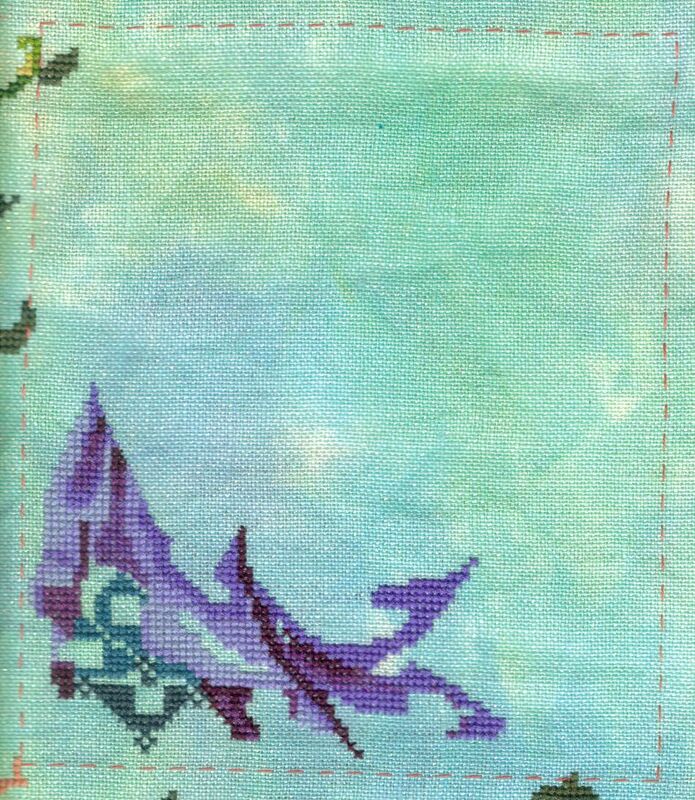 I am inches away from completing Joan Elliott's April Dragons and have the perfect fabric for the June Wizard so that's another one lined up for next month. The Needlecraft Haven Freebie Challenge is all stitched up and ready to be emailed to Christine, I can show that one after this Sunday. I still have to make a start on the Hallowe'en Ornie SAL piece so I think it will be the smaller ghost design. On the plus side, two of my giveaway prizes have arrived (the UK two) but I won't show them until the two overseas parcels have reached their destinations. Finally, I am really enjoying all the answers left for my 400 followers giveaway last post. I have replied to everyone except three "no-reply" people. There are some great suggestions for names to include, some very well known and others new to me who certainly deserve to be better known. I'll make a full list on the Winners Announcement page. Don't forget, you have until Wednesday 29th May to enter, leave a comment on the previous post. I recently acquired my 400th follower! Wow, considering I've been blogging for just over 2 years, that's 4 people a week joining the blog! This is the latest instalment in the Thread Pickerz SAL on FB. I will be having a small giveaway to celebrate my lovely followers. 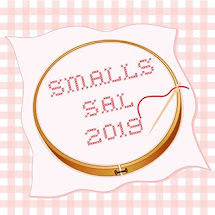 There will be something stitched, some cotton fabric (I have found a great shop that sells lovely fabric for backing ornies and want to share), maybe a cover kit or chart booklet from a magazine, some threads, buttons, ribbons, that sort of thing. I've been trying to think of a good way to do the Giveaway, I do like to make you work for your prizes and it makes for fun reading too. Then this morning I finally finished updating my Happy Dance Blog. 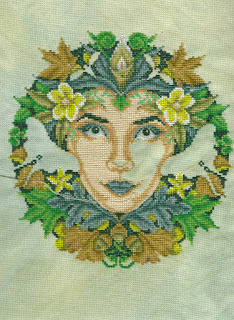 This has been a massive WIP in itself as I've been stitching for 20 years now. 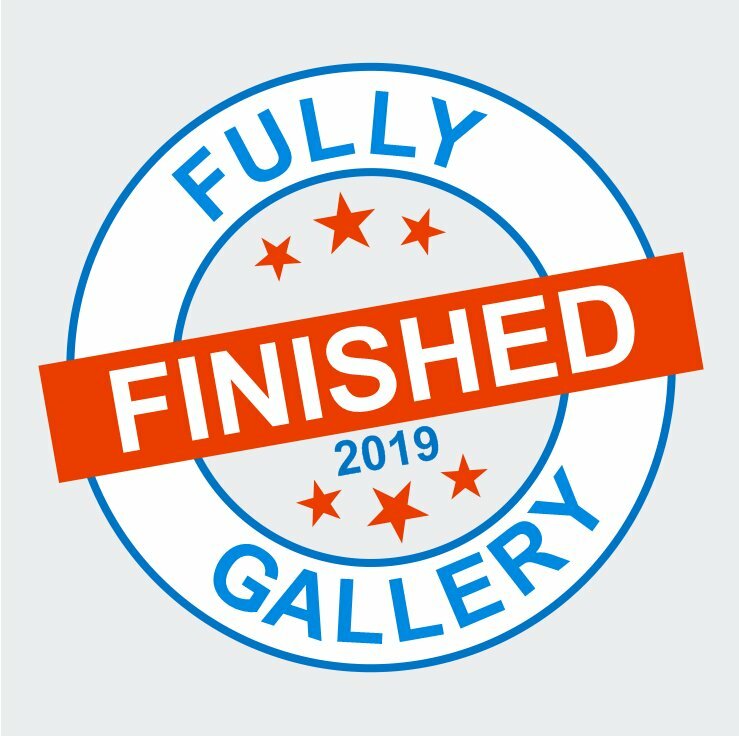 I have added photos of every single piece I have and an entry for those I don't have photos of. I have put exact dates where known and estimated when unsure. One thing is clear - babies hamper your stitching! Pre-baby I was averaging double figure finishes per year despite working 6 days a week. For 2009 (Small Boy's birth year) I managed 2. Since the discovery of the internet output has quadrupled!! Although to be fair, most of it is cards and small projects, freebie challenges and the like. 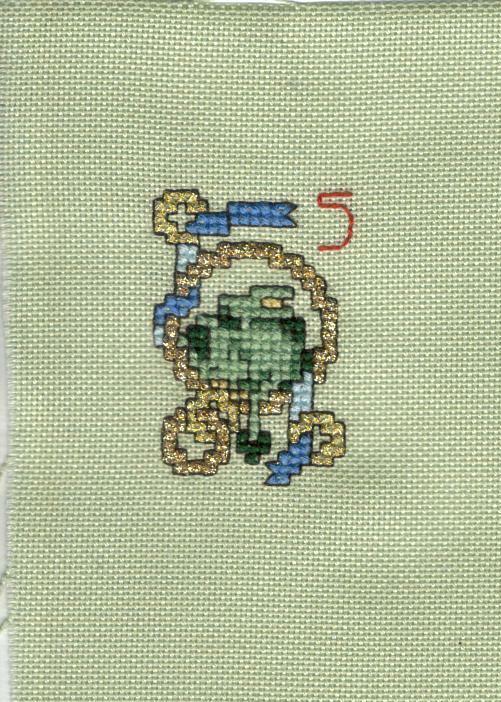 One of the entries I most enjoyed putting together was the Millennium Sampler. Produced as a kit to celebrate the Year 2000 my Mum and I redesigned it between us. I stitched a tree in the centre featuring my parents' and grandparents' surnames and mine (as it was at the time). The outer squares I stitched as charted but around the middle there were several names of famous people who have made a great contribution to life in the last Millennium. So why were there so few women? Is that why it is known as His-story not Her-story or Our-story? So Mum and I put our own list together. We tried for a local flavour where possible, hence the inclusion of Constable and Cavell, a mixture of male and female, people from all walks of life (art, science, exploration, politics etc). I also wanted the four House names from my Primary School to be included (Hillary, Drake, Scott and Columbus) and we wanted people that helped the poor as well as the rich. Cavell (Edith) - nurse born in Norfolk, executed during WWI for saving many lives, both Allied and German. Curie (Marie) - physicist and chemist, Nobel Prize Winner, see also the Cancer Care Charity named for her. Scott (Captain Robert) - Royal Navy officer and explorer, known as Scott of the Antarctic, one of the "Houses" at my Primary School. The fourth "House" at Primary School was Columbus (Christopher) and he was already featured in the main squares so I didn't add him to the middle design. who would you have included on your Millennium Sampler? You only need give one name. I don't expect a long list like mine! I am really quite excited about reading your answers. I know my followers come from all over the world so I'm expecting some names that are new to me, as maybe some of mine were to you. Finally, the more eagle-eyed of you may spot gaps in the more recent blog entries on the Happy Dance blog, that's because I don't show pieces that are gifts or prizes until the recipient had seen them first. So did anyone else sing the song like that? Here are the Five Gold Rings with a sleepy little Dragonlet on his pile of treasure. I stitched the rings in two different metallics, one darker, thicker from Madeira and one paler and thinner from DMC. 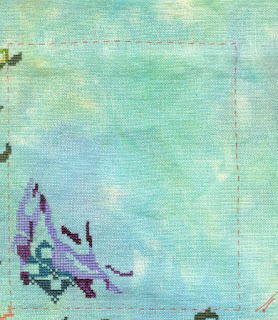 The DMC was definitely nicer to stitch with on 28 count. 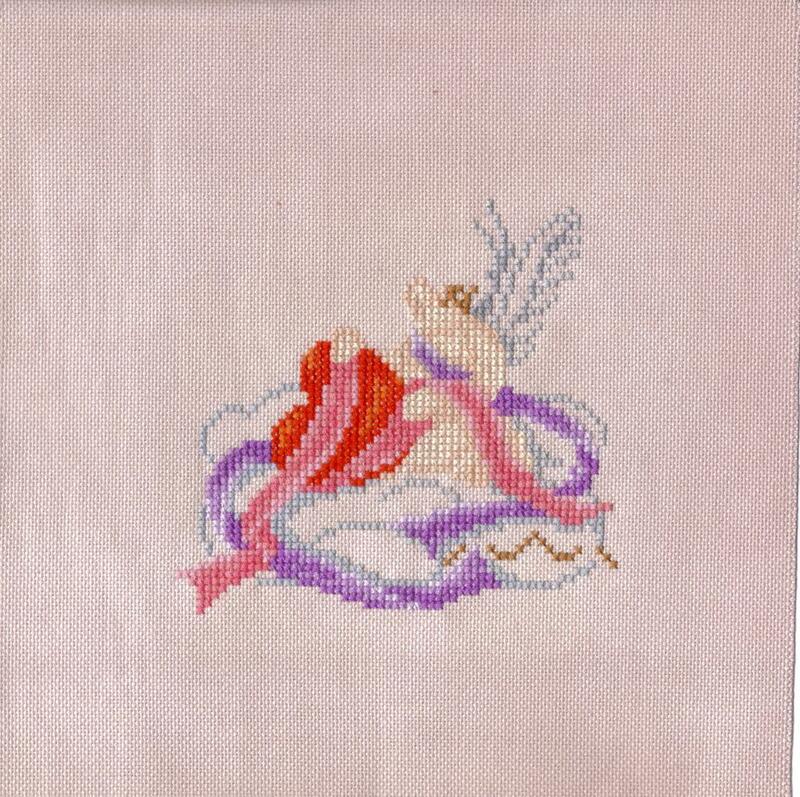 This is Karen's Mermaid for the Large Mirabilia Round Robin. I'm really enjoying stitching this design, anyone want to take a guess which mermaid it is? Finally, there's been alot of talk on Facebook about Pinterest and copyright, that old hot potato! 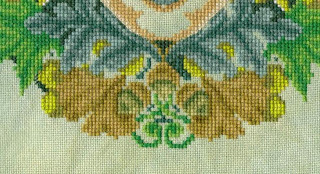 I do enjoy looking at Pinterest boards but have been a little bemused by people pinning actual cross stitch charts instead of just a picture. No-one does that on blogs, everyone links to the original blog or site, so why are people doing it on Pinterest? The whole point of a designer or blogger giving a free chart is to encourage traffic to their website, by pinning the chart anyone can download it and not even acknowledge the original designer. That's just not cricket!! And is, in fact, illegal, even if the design was a freebie. So come on Pinners, give credit where it's due and only pin pictures of the finished designs and always add a link. If you're repinning and the information isn't there, then ask the original pinner. If they can't give it then don't play with them, they're not nice people LOL. 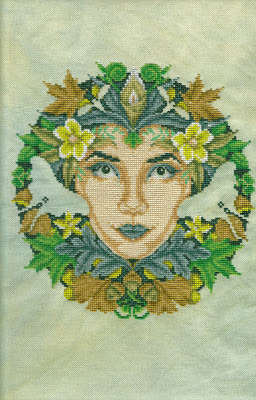 I've stitched all around her face in the ordinary DMC leaving gaps for the dragonflies as they have metallics in them. I've also left the face til last so I can start a fresh skein and not risk a dye-lot change in the middle of it! There is alot of metallic in this as most of the border is Kreinik and there are beads to add too but I do feel the end is in sight sometime this year! The fabric is a 28 count from a Crafty Kitten grab bag so it has no name but looks quite sky-like. The dragons are stitching up so much more quickly than the Cherub did. I have no idea why as I like both designs. As I'm not stitching any of the pixie designs I'm hopeful of finishing both of these and catching up this month. I can also show a finish from last month's Needlecraft Haven Challenge. Christine invited us to choose one of the Snowflower Diaries Spring designs featuring chicks and bunnies. I chose this one because the plant reminds me of Audrey from Little Shop of Horrors! I used the same yellow evenweave as previous Easter/Spring stitches so they can all be mounted together. The bunny in the photo is the one I won in our corner shop's raffle. 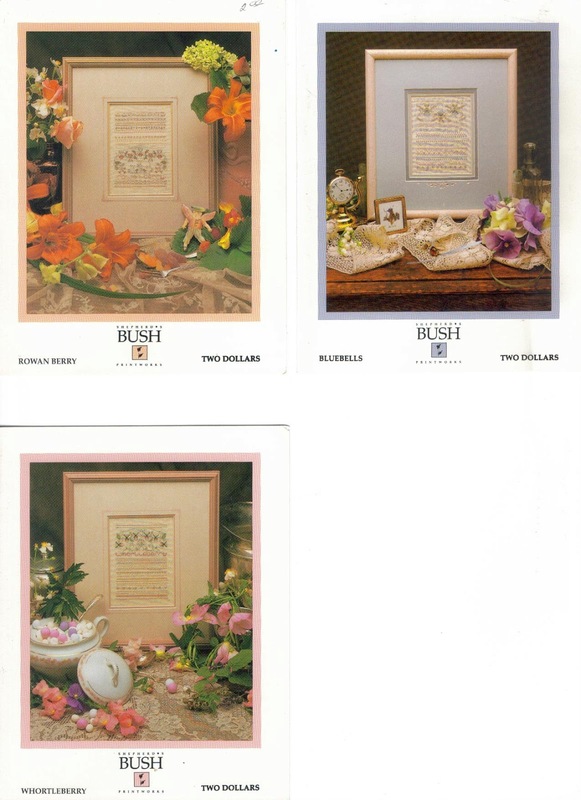 Finally, I had a little stash enhancement via an Esty shop called The Pampered Stitcher and bought these three Shepherd's Bush charts. They are from a series called the Botanicals and I have whortleberry, rowan berry and bluebells. There is also a fourth design entitled buttercups. If anyone out there has this chart they would like to sell to me I would be eternally grateful and your friend forever! edit: further investigation reveals the existence of violets and aramanth!